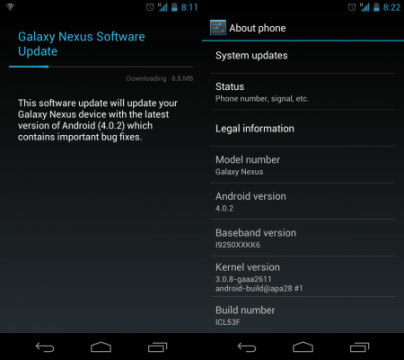 A new update for Galaxy Nexus GSM version has been released. Google update Android 4.0.2 is a minor update at 8.8mb via OTA and it fixes some issues in Android 4.0 Ice Cream Sandwich and with some improvement on the performance of the Galaxy Nexus. If you haven’t check it yet go over to Settings > About Phone > Software Update and download the update. What is Android and What is an Android Device? This entry was posted in Android News, Android Phone, Firmware Updates, Google Nexus, Samsung and tagged Android 4.0, Galaxy Nexus, ICS, Samsung. Bookmark the permalink. Post a comment or leave a trackback: Trackback URL. Re: Want to develop your own Android applications? Click here. Want to develop your own Android applications? Click here.